social bike rides – WeLove2Bike! Los Pobladores refers to the original settlers of Los Angeles, who founded this fair city in 1781. Every year, to celebrate the birthday of Los Angeles, a contingent joins with descendants of these original settlers and walks the 9-mile route taken in 1781 from the mission in San Gabrial to Olvera Street in what is now downtown Los Angeles. Many walk the route in this annual ritual, while others make the journey by bicycle. This year I joined the group on bicycles. We rolled past some cool places, such as the Ming Ya Buddhist Association along Valley Boulevard. Soon enough, we arrived at El Pueblo, just across the street from Union Station. And we got to watch the final part of the procession. La Plaza United Methodist Church faces El Pueblo de Los Angeles Historical Monument. Free bike valet parking was available to us on this street off El Pueblo, just across from the Chinese American Museum – I’ve visited before and highly recommend it. Heading to the bike valet, I got to meet Bikie Girl Maria, whom I’d noticed riding in her new Wick-It Black Bloomers. A ceremony featured some direct descendants of the original settlers and natives who shared traditional blessings. The prayer in the four directions. One of the dancers, relaxing after the performance with her companion. Smokey Bear was among the attendees observing the hoopla. If you venture down Olvera Street, you will come upon America Tropical Interpretive Center, where you can see the rediscovered Siqueiros mural completed in 1932, now sheltered for conservation and viewable from a special platform. Also viewable from above Olvera Street is the beautiful Post Office Terminal Annex Building, which served as the central mail processing facility for Los Angeles from 1940-1989. 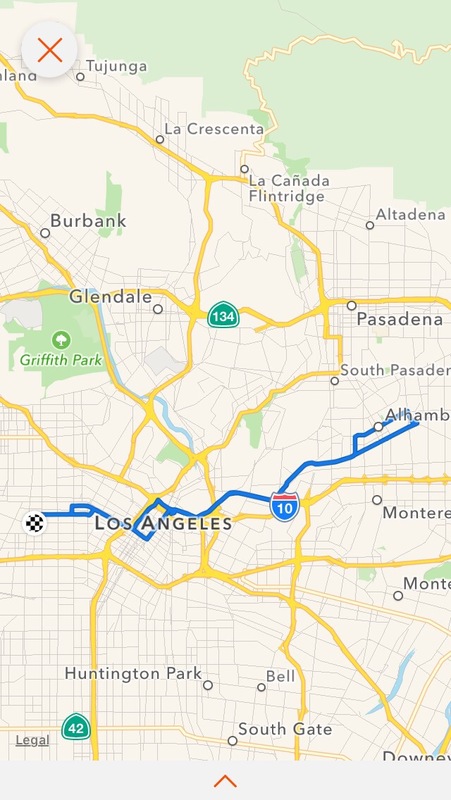 My complete route for the day, 30 miles total. This will be remembered as one of my favorite urban cycling adventures.